Having some tables and an API is all very well, but it's completely useless unless you can access it from your mobile app. 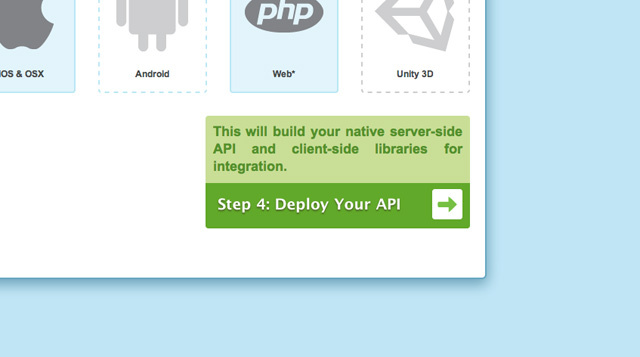 To that end, Kumulos has a deployment step that makes your API available to your target mobile platform. Deployment will also build native libraries to kick start integration of Kumulos into your app. To get going, simply click on the targets you'd like to deploy for. Here we've selected "iOS/OSX" and "Web". This will give us an Objective-C library and a PHP library for our project. When you've chosen your platforms, simply click the big green button and your API will be deployed, and your libraries built. Once you've deployed your API, you're ready for the Final step: Downloading your libraries and starting integration. why i can not select Unity3D platform ?